It’s no secret that in the corporate world, you need to carefully plan and spend in order to maximize your precious marketing and advertising budgets. The intensity is turned up even higher (not to 11, but close!) when you are responsible for marketing or fundraising for your nonprofit organization. In our 22 years in business, we’ve had the pleasure of working with many nonprofit organizations, often at reduced rates or even pro bono. We gladly take on the challenges that a limited budget can provide…and dig in on the creativity a little deeper to make something great happen. Recently we had the pleasure of being hired by Goodwill Industries of the Chesapeake. With a wide variety of offerings in their various and much needed community services, they have to be careful and effective with every dollar. Enter animation. As you are likely seeing in the media these days, more and more entities are turning to animation for many good reasons. It can be a cost effective, easy to digest way of sharing important information. It avoids the cost of filming and allows you to be diverse/neutral in the characters you are presenting. Even the Baltimore Ravens have just adopted an long animation for their famous in stadium “Don’t Be A Jerk” conduct campaign. 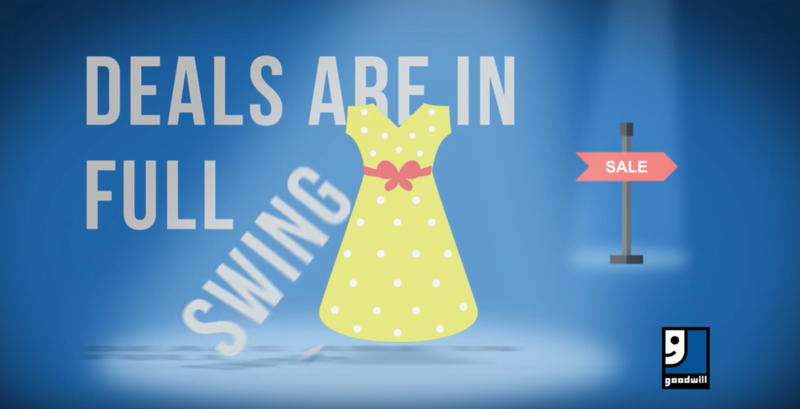 For Goodwill, we created a lively animation to help promote their “Saturday Spectacular Sale”, with 50% off clothing, boutique apparel and linens on the last Saturday of every month. All indications are that this is hitting the mark for Goodwill and driving people to the special bargains. If you need any animation support for an upcoming event, promotion or advertisement…please let us know! And we’ll see you soon at Goodwill!